My Jack Russell is tiring up the house while I'm at work. Is it ok to leave him outside in his kennel for 8 hrs? the reason he is tearing things up is because he is bored, and suffering for being alone, please try to get a dog walker you can TRUST to take him out while you are away, or things will only get worse and you will have a very unhappy dog. Sorry but this is far too long for a dog to be left in a kennel,and on his own, does the kennel have a run,?? 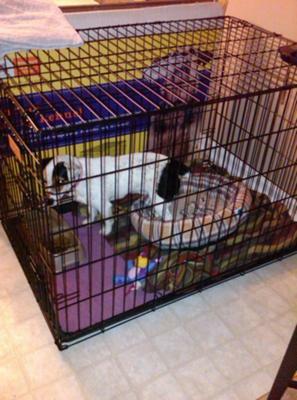 why not confine him to just the kitchen, but do NOT cage him for this length of time, he needs to go outside for a wee, also to see someone during this time do you have a friend that might let him out for 20 minutes or so,and then put him back in the kitchen, he can be left with the crate door open.